Picking the right food for our dogs is a daunting task: we want to ensure a long and healthy life for them, but with the recent recalls and the overwhelming amount of, often contradictory, information we are left confused and unsure of our choices – are we doing what’s best for our pooch or are we unintentionally hurting them? Selecting the right type (raw, home cooked, canned, kibble) and brand is difficult for any dog owner, but for an owner of a dog with allergies, dietary or health problems this becomes a real nightmare. 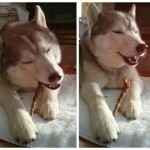 Many Huskies tend to be picky eaters, have sensitive stomachs or suffer from allergies – Rocco is no different. We had spent the past 2 years trying to find just the right food; food that would not give him diarrhea, itchy paws and ears, will keep his energy at a level it needs to be and provide him with all necessary nutrients. We talked to vets, other husky owners, spent hours on the internet researching and experimented with a variety of foods, and I’m tempted to say we have finally figured things out and found what works for our guy. 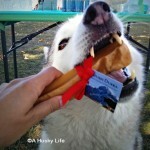 I thought I would share some of the lessons we’ve learned along the way to help those that are still searching for the perfect diet for their Husky. Big thanks go out to our dog trainer who’s been an amazing help and resource. When we adopted Rocco at 11 months he was malnourished due to the persistent diarrhea he’s had all through puppy-hood. Our priority was to get his allergies under control and provide him with food that would bulk him up and bring his energy up. I will list all the foods in chronological order and the reasons why we moved away from them. We were very happy with this food and used it for about 6 months. We decided to switch because we were concerned that the 38% crude protein content is too high for an adult, non-performance dog. Great brand, lower protein – 33% , great quality, unfortunately didn’t sit well with his stomach. It wasn’t the best fit, neither bad nor good. We decided to give the raw trend a try, especially since we heard a lot of good things from other husky owners. The first two months were great! His stools, energy, coat – everything improved. But after the initial boost his energy started to decline and his eyes were becoming dull and had a bit of red around them. Our vet suspected zinc deficiency. 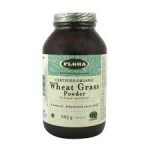 A highly recommended product on many Husky blogs, also a friends’ Blue Heeler with a bad stomach does very well on it. We used it for about a year, he did very well on it. We didn’t have any complaints until the Diamond Foods recall, which made us quite nervous. Our trainer was also noticing his energy and muscle mass declining slightly – considering it was summer we didn’t think much of it. After his seizure we decided to revisit his food and make some drastic changes. 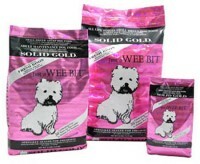 We were a bit skeptical at first, considering this is a food for small breed dogs and it contains barley, but we’ve seen an overall improvement in his energy and health and he hasn’t had any problem with allergies. 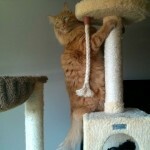 Considering his health problems we try to have a very tight control over his diet. We now only use 2 proteins in his food: bison and duck – this also includes treats. We are religious about buying only Canadian or US made treats and try to avoid any possible sources of toxins. 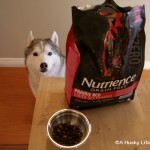 This is what works for our dog, there is no guarantee it will work for your Husky and it is always wise to ask your vet before making any changes to your dog’s diet. 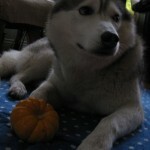 Why is Pumpkin Good for Dogs?